“A group of researchers from the UK and the US have used machine learning techniques to successfully predict earthquakes. Although their work was performed in a laboratory setting, the experiment closely mimics real-life conditions, and the results could be used to predict the timing of a real earthquake. The team, from the University of Cambridge, Los Alamos National Laboratory and Boston University, identified a hidden signal leading up to earthquakes and used this ‘fingerprint’ to train a machine learning algorithm to predict future earthquakes. Their results, which could also be applied to avalanches, landslides and more, are reported in the journal Geophysical Review Letters. For geoscientists, predicting the timing and magnitude of an earthquake is a fundamental goal. Generally speaking, pinpointing where an earthquake will occur is fairly straightforward: if an earthquake has struck a particular place before, the chances are it will strike there again. The questions that have challenged scientists for decades are how to pinpoint when an earthquake will occur, and how severe it will be. Over the past 15 years, advances in instrument precision have been made, but a reliable earthquake prediction technique has not yet been developed. As part of a project searching for ways to use machine learning techniques to make gallium nitride (GaN) LEDs more efficient, the study’s first author, Bertrand Rouet-Leduc, who was then a PhD student at Cambridge, moved to Los Alamos National Laboratory in New Mexico to start a collaboration on machine learning in materials science between Cambridge University and Los Alamos. From there the team started helping the Los Alamos Geophysics group on machine learning questions. The team at Los Alamos, led by Paul Johnson, studies the interactions among earthquakes, precursor quakes (often very small earth movements) and faults, with the hope of developing a method to predict earthquakes. Using a lab-based system that mimics real earthquakes, the researchers used machine learning techniques to analyse the acoustic signals coming from the ‘fault’ as it moved and search for patterns. The laboratory apparatus uses steel blocks to closely mimic the physical forces at work in a real earthquake, and also records the seismic signals and sounds that are emitted. Machine learning is then used to find the relationship between the acoustic signal coming from the fault and how close it is to failing. The machine learning algorithm was able to identify a particular pattern in the sound, previously thought to be nothing more than noise, which occurs long before an earthquake. The characteristics of this sound pattern can be used to give a precise estimate (within a few percent) of the stress on the fault (that is, how much force is it under) and to estimate the time remaining before failure, which gets more and more precise as failure approaches. The team now thinks that this sound pattern is a direct measure of the elastic energy that is in the system at a given time. “This is the first time that machine learning has been used to analyse acoustic data to predict when an earthquake will occur, long before it does, so that plenty of warning time can be given – it’s incredible what machine learning can do,” said co-author Professor Sir Colin Humphreys of Cambridge’s Department of Materials Science & Metallurgy, whose main area of research is energy-efficient and cost-effective LEDs. Humphreys was Rouet-Leduc’s supervisor when he was a PhD student at Cambridge. “Machine learning enables the analysis of datasets too large to handle manually and looks at data in an unbiased way that enables discoveries to be made,” said Rouet-Leduc. Although the researchers caution that there are multiple differences between a lab-based experiment and a real earthquake, they hope to progressively scale up their approach by applying it to real systems which most resemble their lab system. 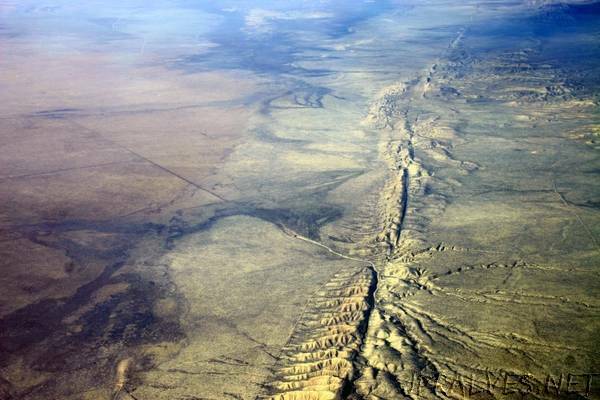 One such site is in California along the San Andreas Fault, where characteristic small repeating earthquakes are similar to those in the lab-based earthquake simulator. Progress is also being made on the Cascadia fault in the Pacific Northwest of the United States and British Columbia, Canada, where repeating slow earthquakes that occur over weeks or months are also very similar to laboratory earthquakes.